The plethora of green tea cheesecake recipes is almost proof in and of itself that green tea goes well with cheese. Now, cheese sommelier Cynthia Gold addresses this underexplored niche in the gourmet world by giving a broad overview of which teas pair well with which gourmet cheeses. 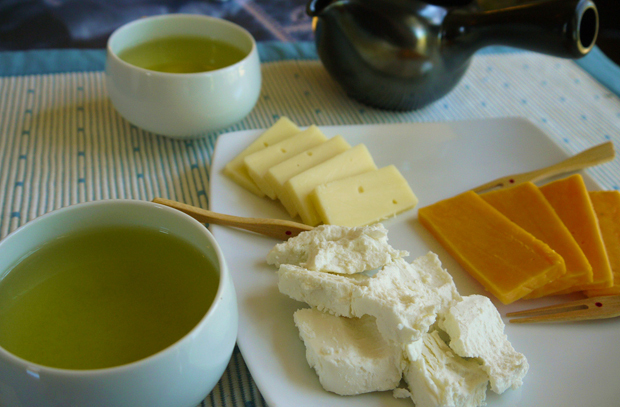 In the end, the rules of pairing tea and cheese are subjective. Steep for yourself. Indeed. I recommend starting this gastronomical journey by sitting down with your favorite green tea — one of ours, maybe? — and a plate of your favorite cheeses. In fact, invite a friend or two over and make an event out of it. At the very least, it will be an excuse to drink a lot of green tea, eat a lot of cheese, and generally have a good time with friends. Good food, good drink, and good friends — now there's an ideal pairing. The Monk tried Frosty Garden with some gruyère, fresh goat cheese, and red Leicester (left to right). The green tea's sweet, clean flavor blended superbly with the sharp taste and light creaminess of the gruyère and the red Leicester but was overpowered by the rich, salty creaminess of the goat cheese.